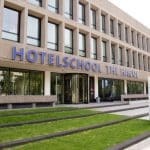 Hoge Hotelschool Amsterdam is part of Hotelschool The Hague. Hotelschool The Hague was founded in 1929 by the HORECAF, the Dutch organization for Hotels, Restaurants and Bars. Since then, the school has grown into one of the best hotel management schools in the world. Graduates of Hotelschool The Hague can be found in top management positions all over the world. Apart from a Bachelor education Hotelschool The Hague also offers a Master programme. Furthermore the school founded a research centre in 2010. Profit and non-profit organisations which want to integrate hospitality in their day-to-day process can obtain advice from Hotelschool Performance Management BV. Are you professional, ambitious and do you want to work in an international business environment? Then join us at Hotelschool The Hague for our Bachelor Business Administration in Hotel Management (BBA.HM), ranked top 5 worldwide! Hotelschool The Hague has been, ‘At the heart of Hospitality’ since 1929, and you join a warm, welcoming and international community in either The Hague or Amsterdam, with students from over 50 nationalities. Our graduates can be found all over the world, working as Hospitality Leaders, Hospitality Entrepreneurs, Consultants and Management Specialists in a variety of industries. You explore the world of hospitality, participating in two international internships at leading hospitality chains and businesses around the world. During the Bachelor Programme you develop your social skills, business skills and practical skills. You will form lifelong friendships during your first year on campus accommodation. After four years, you graduate with a Hotelschool The Hague Bachelor’s Degree and excellent career opportunities in hospitality, but also in other industries where hospitality makes a difference such as Retail, Financial Services and Event Management. It’s your Passport to the World! For the first year at Hotelschool The Hague, you live in the student residence, the Skotel. The Skotel is both your home and the school’s training hotel. Living in the Skotel is part of the Bachelor Hospitality Management programme. As you live together and share a room you learn how to socially and cross-culturally interact with fellow students while improving your personal skills in many different ways. This personal growth, as well as your experience to work in teams, makes you be a step ahead of your future career. You’ll feel immediately at home at either one of our excellently facilitated campuses. In Amsterdam, both the school and the Skotel are located in the same, completely refurbished building, just outside the beautiful and historic centre of Amsterdam.